There's the guy responsible for all this hoo-hah! Get em!!! Seriously, I'd love to see the sheet of mixes you have as we're likely to see those aircraft coming in 1/32 in the not too distant future. Esoteric stuff notwithstanding (Ki-115 Tsurugi, et. al. ), this would be a great reference to have. Mods, if Greg posts the list can we make it sticky someplace for all to reference? I knew about the gear doors being the exterior color both inside and out, but did not know about the gear wells. The actual wells are not Metallic Blue? BTW mixed the colors today. Thanks! The actual wells are not Metallic Blue? Only for Nakajima-built aircraft Crash; for Mitsubishi-built aircraft, the undersurface colour is correct. The two manufacturers painted their respective aircraft quite differently. 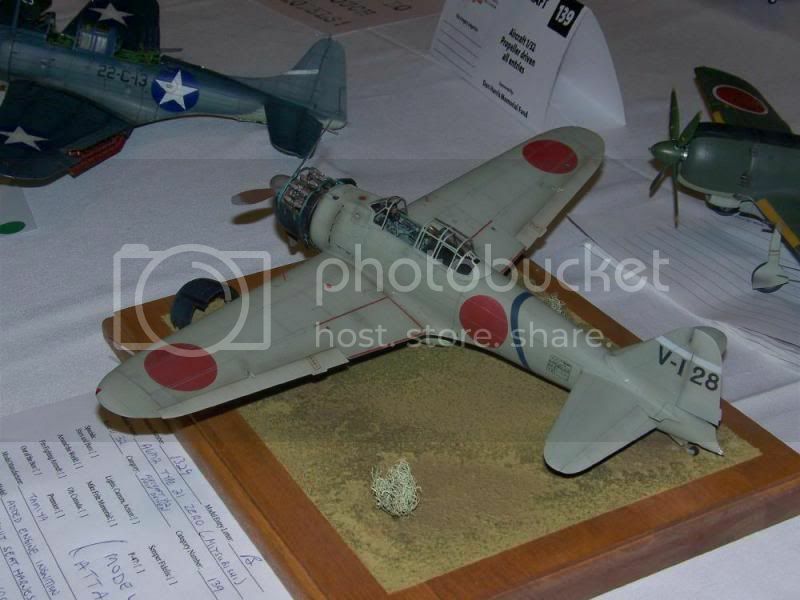 This is a 1/32 Tamiya A6M2 painted using Mr Springer's mixture, then weathered to show effects of salt air and lots of sun. That is gorgeous! Did you lighten the base color for a weathered/scale effect appearance or just use the mix straight? Here goes. These are taken from a Word document that I hand out when I give a PowerPoint presentation of Japanese Naval Aircraft colors. Mixes matched to the coating on the metal portions of the airframe of the Mitsubishi-built Zero flown by Lt. Fusata Iida to his death at Kaneohe NAS and to Zero AI-154 that crashed at Fort Kamehameha, Pearl Harbor on December 7 1941. Mix matched to a cloth artifact from Zero BII-120, landed on Niihau Island, Dec. 7, 1942. Likely also to match cloth on control surfaces of AI-154 shot down at Ft. Kamehameha and BI-151 crashed at Kaneohe NAS the same day. Mixes matched to the overall metal surfaces of the Nakajima-built Zero shot down on Midway Island, June 4, 1942. This color would be found on all metal surfaces of the airframe, except the cowling. This color also found on some Vals at Pearl Harbor. Mixes matched to a fabric surface taken from the same Zero. This gray color would be found on all fabric-covered control surfaces. Mix for the gray-green base coat found on the Nakajima Type 97 "Kate" attack plane that crashed at the Navy hospital at Pearl Harbor. 40 parts "Faded Olive Drab"
Brush-applied yellowish-khaki coat over natural metal on Type 99 Val shot down in Middle Loch, Pearl Harbor. Tail code AII-251. Mid war Nakajima cockpit gray-green. This will yield a primarily blue color with a slight green tint. Spray on with a light color feed and stop when you are satisfied with the color. You can experiment with different mixes. Green has a very strong chroma so very little is needed. The Smoke is used to tone down the clear colors as otherwise they will give a bright "candy apple" phony look. Mitsubishi-built Zeros have their landing gear bays and doors painted inside and out in the exterior gray-green-khaki color. Early Nakajima Zeros have their landing gear bays in aotake. The doors are the underside color except for the interior surface of the central 'butterfly' doors that are coated in aotake. Cowlings, the areas of the fuselage beneath the canopy in front of and behind the pilot as well as the inner surfaces of the canopy frames are blue-black on Mitsubishi Zeros and black on Nakajima Zeros. Bear in mind that all of these mixes were matched to extant artifacts. Have they changed in 70 years? Yes, but they are from protected areas or were souvenired and stored away from direct light since the war. In service, all coatings weather rapidly. I am providing you with a starting point. If you don't like the appearance of a mix, modify it until it suits you. After all, you are building the model to please yourself. WOW! Thank you very much for sharing this info. Today I should be able to get some "quality" time at the bench, so you couldn't have posted this on a better day. Greg, thanks on behalf of the entire LSP community, including their pets and significant others, for posting this info. We salute you! Thanks loads for the data and thanks even more for taking the time to post it! Thanks for the kind words guys. You are all very welcome! That's great info ! I just ordered a bunch of Mr Color and Colourcoat paints to get this stuff accurate. It's overloading my OCD ! Glad to have you here, Gojira. Wow, this must be a record for a necro thread. Eight and a half years - 3127 days - between posts!